A football sexism row prompted a regional daily to call on the sport’s most powerful men to take the issue more seriously. 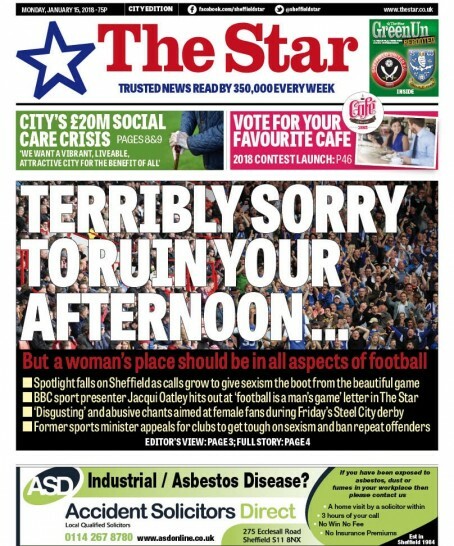 The Star, Sheffield, splashed yesterday on the subject after “disgusting” chants were aimed at a female relative of Sheffield United manager Chris Wilder during their derby match with Sheffield Wednesday on Friday night. The Star also came under the national spotlight over the weekend after football commentator Jacqui Oatley took aim at a letter by a reader, published by the newspaper, who claimed he was irritated by female reporters covering matches for the BBC. Jacqui posted a photograph of the letter next to a picture of herself and other female reporters in the Watford FC press box on Saturday, offering a “little shout out to our friend, Ken, of Sheffield Star letters page fame”. The Star had previewed Friday’s derby with a reversible pre-match supplement, which had given both United and Wednesday fans a unique front cover dedicated to their team. In an editorial accompanying yesterday’s splash, Star editor Nancy Fielder wrote: “The sad truth is we haven’t included most of the language and insults that were hurled at women during Friday’s derby. “It has no place in a newspaper and I will not repeat it. Much of it was aimed at women who just happen to be related to leading figures at our city’s football clubs. “Does that mean they deserve it? Does that make it ok? Should we laugh it of as banter? No, it means the most powerful men in football know exactly what we’re talking about and should use their influence to stop it. “A series of events over the weekend came together to spark today’s front page. Perhaps we should have done it long ago. I’m not saying the derby was any worse than other matches but, as I wrote on Friday, Owls and Blades fans have to face the opposition in the office today.